00:10:00 6 servings, 1 cup (250 mL) each. 6 servings, 1 cup (250 mL) each. Need a make-ahead salad recipe for an upcoming party? 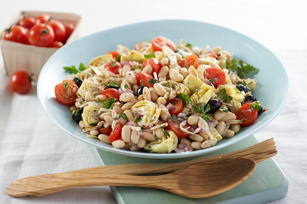 This Mediterranean Bean Salad is worth a try. Prepare this bean salad ahead of time, then toss in the cheese before serving - how's that for effortless entertaining? Add 1 can (170 g) solid white tuna, drained and separated into large chunks, to salad. Salad can be made ahead of time. Prepare as directed, but do not add cheese. Refrigerate up to 8 hours. Toss with cheese just before serving. Serving Size 6 servings, 1 cup (250 mL) each.